The range of industrial applications in the area of electrical heating is so diverse and extensive that it is often impossible to fulfil the demands with standardised products. Nonetheless, the cost-conscious technician, engineer and businessman tries to allow for and adhere to certain standardisations in the development and construction of industrial furnaces and thermal plants. 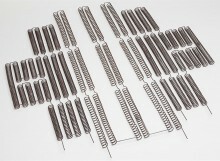 Heating elements and insulation are wearing parts with varying durability depending on load and use. The actual concept, calculation and construction of heating elements have a critical impact on this and are determining factors in future operating costs. As a leader in the field of electric heating, it is key for us to solve our customers’ problems and implement solutions through our own design and development department. Our team of engineers and technicians is ready to help from the initial idea through to the consulting, analysis and design to assembly on site. For our work, we have modern tools such as CAD construction and calculation programmes for dimensioning or determining heat transfer. For many new applications, we construct prototypes for trials, which are developed through to readiness for series production in co-operation with our customer.